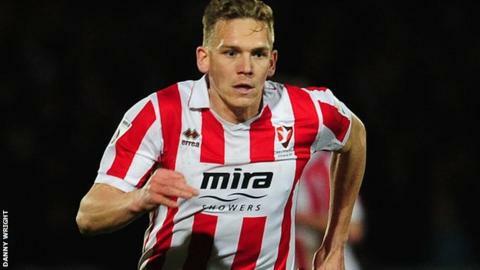 Cheltenham Town striker Danny Wright has been suspended for three matches by the Football Association for violent conduct in Friday's win over Grimsby. An FA panel deemed the 31-year-old should have been sent off following an incident - not seen by the officials - that followed Cheltenham's second goal. Wright provided the assist for the goal and then made contact with Mariners keeper James McKeown while celebrating. The FA is also investigating incidents of coin throwing during the same match. A Cheltenham statement said Friday's game "is under investigation for incidents of coin throwing from home supporters and a smoke bomb released by the visiting fans". The National League leaders' 3-1 home victory saw them extend their advantage at the top over local rivals Forest Green Rovers. Wright, Cheltenham's top scorer this season, netted the hosts' third goal with 13 minutes remaining. He will miss trips to Guiseley and Macclesfield either side of a home game against Halifax, but could return for Cheltenham's final fixture of the regular season, at home to Lincoln City, on 30 April.